A prop box is a teacher-created resource full of age-appropriate and meaningful activities focused on a central theme. Prop boxes work much like learning centers in an elementary classroom with the important addition of providing opportunities for socio-dramatic play. Prop box play engages students in self-chosen activities that promote critical thinking and learning. The prox box activities described here were developed around the central theme of weather because the concept is expansive enough to include many activities and concepts. This article is a great teacher resource to use when planning a thematic unit. This article defines a science prop box, and how/when to use it. A prop box is a teacher created resource full of age-appropriate and meaningful activities that focus on a central theme. Creating prop boxes for your students is a great way to incorporate inquiry. The prop boxes should interest students and allow them to explore the materials given. These boxes incorporate basic knowledge while engaging in fun activities. This article strictly focuses on weather and does so in a descriptive and useful way. Everything you need for your weather science prop box is in this article! I will definitely be using this idea in my own classroom! Students will be able to playfully engage their minds while gaining scientific knowledge. If you want your students to become actively involved in their own learning and participate creatively and uniquely, give these science prop boxes a try. This article explains that a prop box is a themed collection of activities that are appropriate for a given age group. In this article the author provides an example of her prop box about weather for young students with a synopsis of all of the activities included in that box. The author explains the rationale behind the development of these boxes and she explains how they differ from learning centers. This is an interesting article that focuses on the use of constructive play activities toward learning. It can serve as a model for other collections of activities. 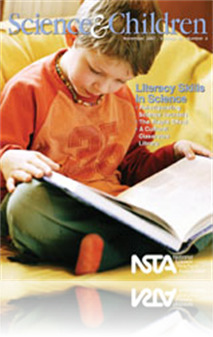 This article is great for a Elementary Science teacher wanting to add some inquiry science instruction. Great Article! !